Last week’s multi-inspector general progress report on the U.S. effort to stabilize Afghanistan was predictable in one respect: it once again painted a dire picture of security conditions in that war-torn and economically ravaged country. What was less predictable is that the authors, led by the Pentagon IG’s office, announced that their evaluation was hampered by the recent 35-day lapse in appropriations. “Due to the partial government shutdown and the furlough of staff at the Department of State and the U.S. Agency for International Development, this report does not contain sections on governance and civil society, humanitarian assistance and development, and stabilization and infrastructure,” noted the report signed by the Defense Department’s deputy IG Glenn Fine, State Department IG Steve Linick and USAID watchdog Ann Calvaresi Barr. No one from inside State or USAID reviewed or contributed to the report, the IGs wrote, although the IGs at State and USAID reviewed and concurred with the report. “Working in close collaboration, we remain committed to providing comprehensive oversight and timely reporting on” Operation Freedom Sentinel, they wrote. This report from the lead inspector general summarizes recent reports from partner oversight agencies, such as the Special Inspector General for Afghanistan Reconstruction and the Government Accountability Office. It cites the Pentagon Comptroller’s figures showing that the department has spent $1.5 trillion in support of contingency operations since the domestic terrorist attacks of Sept. 11, 2001. 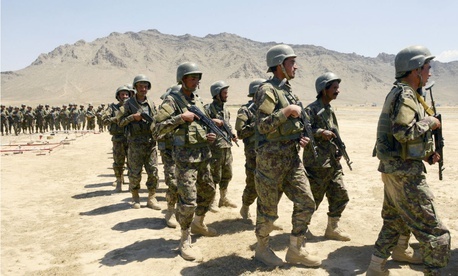 The total cost of operations in Afghanistan over that time was $737.6 billion, of which $157.9 billion has been obligated in support of [Operation Freedom Sentinel] since that operation began in 2015, the report said. It now amounts to about $3 billion monthly. The department told its IG that about 14,000 military personnel supported the operation during the quarter, with some departures toward the end. “While the number of U.S. military and civilian personnel remained constant, the number of contractors increased by nearly 14 percent during the quarter, reaching the highest level since the 1st quarter of fiscal 2016,” it added. “The greatest growth during the quarter was among contractors who perform logistics/maintenance, management/administrative, and training tasks. The steady diet of bad news from IGs examining U.S. operations in Afghanistan and Iraq have bothered President Trump, who has demanded both that the IGs be denied certain classified information and that they publish such reports to a limited audience.